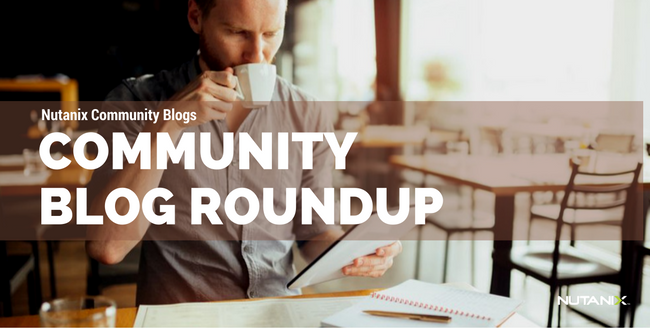 Blog Roundup: What did you miss this week? It’s the end of another week, and the Nutanix team was at Microsoft Ignite and had an excellent time, it’s always fun to meet and chat with folks in person who you typically spend time with virtually on Twitter and other social media platforms. There was a lot of news this week from Ignite, and we've included some of the announcements in this week's blog recap, in addition to some of our recent blog posts that you may have missed, enjoy! At Nutanix, we care for the global communities where we live and work, and promote a culture of empathy and giving back. Over the past few weeks, it was my honor to launch Nutanix’s new Corporate Social Responsibility (CSR) program aptly named .heart. When you look for an on-premises datacenter solution or a managed service, you want to be sure that the technology powering your services is based on industry-leading cutting-edge solutions that provide performance, reliability, and scale. Microsoft is announcing the general availability of Windows Server 2016 at the Ignite conference in Atlanta. For Windows developers and IT-pros, the most exciting new Windows feature is containers, and containers on Windows Server 2016 are powered by Docker. This year, Nutanix is hosting it's first .NEXT conference in Vienna and we are super excited to be there. In addition to the cool technical sessions, Vienna is a beautiful place and if you are staying a few extra days, here are a few spots you might want to check out and enjoy. Microsoft is seeking to do more than just solve problems for the IT professionals it serves; the company said Monday in connection with its Ignite 2016 conference. The company is seeking to provide opportunities for IT professionals to drive the "digital transformation" of the businesses they work with -- making IT much more of a value-add than it once was. On the Solutions & Performance team at Nutanix, we’re often working with customers or prospective customers to help them identify what they really need their hyperconverged infrastructure to do and how to evaluate their platform options based on those specific requirements. I’m incredibly excited that this morning at our Ignite conference in Atlanta we launched the newest release of our server operating system – Windows Server 2016! Now that we’re ready to share it with the world, I want to take a moment to thank our customers who helped shape this exciting release. As the XXXI Olympic Games came to a close, we were again reminded of the dedication required to compete at extraordinary levels. Athletes such as Usain Bolt, Michael Phelps, and Simone Biles clearly separated themselves from the rest of the pack to be the fastest and the most consistent. Hope you enjoyed this week’s roundup, and you can always continue the conversation on our community forums.